That. Stare. Yeah! Your favorite badass heroine is here. Enjoy the chapter! 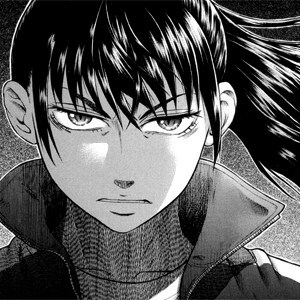 Teppu 20 – Your eyebrows are as thick as usual today. Thanks a lot to the Brazilian scanlation group Koisei Scans for the great redrawings. I was meaning to release earlier this chapter, but for some reason, when a chapter has more than 20-30 pages, I face some kind of wall and it takes me much longer than expected to work with it. Anyway, it’s done. Chapter 21 is already translated, but I need to clean it, so if everything is fine it should be released around Tuesday. I just saw the public raws for chapter 22 and… WOW! what a chapter. Ohta Moare is really back! I sent those raws to our translator, but for the cleaning I’d rather wait until I get the latest Good! Afternoon and scan by myself that chapter. We are going to prepare some nice goodies for our 5th anniversary next month, so we need your help. A couple of translators and cleaners is very much needed! That’s all for now pals. See ya! Outstanding, very awesome, thanks a lot!!! Very nicely done, like always. Thank you very much for this translation! can it get better than this? it seems! this has so much potential… Is really powerful I’M TOO EXCITED!